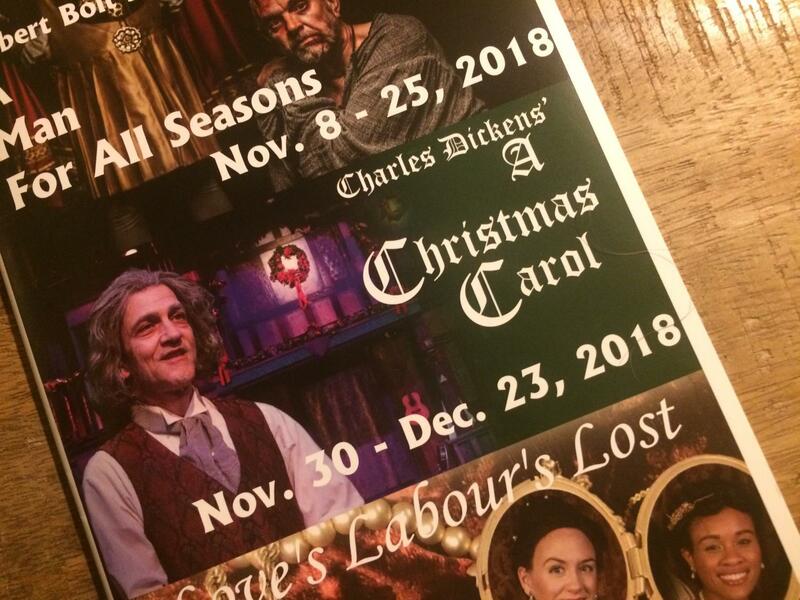 Playgoers received programs for the Shakespeare Tavern’s performance of A Christmas Carol. Vivid, vivacious, and passionate, the company’s interpretation leaves an indisputable mark on the viewer. Light on traditional dialogue and heavy on singing, it more than earns its keep as a venerable Atlanta holiday tradition. When Charles Dickens first wrote the short novella A Christmas Carol in 1843, it seems highly unlikely he expected its popularity to last long. Most likely, he intended it as a kind of Christmas gift to his devoted public, a one-off creation for the benefit of his readers; nonetheless, it soon took off, and Dickens found himself giving public readings every Christmas for years on end. Ebenezer Scrooge, Bob Cratchit, and Tiny Tim stubbornly persisted in the public memory, and nowhere in Atlanta do they survive more fully than in the Atlanta Shakespeare Company’s yearly production of A Christmas Carol. Adapted and directed by company veteran J. Tony Brown, the interpretation, performed each Christmastime in the group’s distinctive venue, the Shakespeare Tavern, features live narration rather than continuous dialogue, amounts of singing rather prodigious for a play not ostensibly a musical, and a highly interactive, surrealist performance style. While unconventional, the production largely succeeds; the narrators provide a storybook feel and frequent humorous effect, while the singing gives the performance a joyous and intensely emotional atmosphere befitting the season. The costumes and sets, granted, quite frequently feel decidedly below par for the company’s efforts, and the narration sometimes descends into repetition and unnecessary moralizing. Nonetheless, the staging overall does considerable justice to the Dickens original. The highest praise, though, ought to go to this year’s stellar cast. Drew Reeves makes a magnificently prickly, deadpan Scrooge, and if his lugubrious manner sometimes seems a bit affected, it certainly achieves the desired effect. The surrounding ensemble of narrators and performers rounds out the performance wonderfully. In particular, Gabriella Anderson comports herself with merry aplomb, and Enoch King’s striking, emotional performances, packed liberally with humor, irony, intensity, and authenticity, constitute a true pleasure to behold. The actors thus form the strongest part of the production and its unquestionable emotional center. A Christmas Carol, then, succeeds quite thoroughly in producing an enjoyable, authentic, and moving holiday experience. If at times the play’s technical accoutrements seem a bit below standards, the performance more than makes up for its rough edges with its power, joy, and intensity. The Shakespeare Tavern thus might well become a worthy addition to any family’s holiday traditions. This story was originally published on The Chant on December 21, 2018.